Every day this Advent we will be sharing reflections from Christian authors. Today's is by Sinclair B Ferguson. The Christmas season will present plenty of opportunities to test our patience: packed trains, traffic jams, crowded shops, orders we made on websites arriving too late—or without batteries—not to mention difficult relatives or over-excited children! several different words in the Greek New Testament. Paul’s verb here (makrothumeō) means “to be long-tempered”. He seems to have associated this with humility and gentleness (Ephesians 4 v 1-2; Colossians 3 v 12). It shows itself in the way Christians “bear with” one another. acts and reacts without tensing up in irritation because life isn’t fair, without blaming other people for what we are experiencing, and without planning how we’ll get even. Have you ever wondered about these words in Charles Wesley’s Christmas hymn “Hark! The herald angels sing”? and a teenage mother. The child in the manger is the perfect example of divine patience. The rest of his life gave expression to it. How long suffering he was. He experienced opposition, virtually from the moment he stepped into the world. Later he tasted misunderstanding in his own family, who didn’t trust him. And then those disciples—so often foolish, at the most critical juncture in his life, they disappointed him. “Have I been with you so long, and you still do not know me?” Jesus asked Philip (John 14 v 9). “Could you not watch one hour?” he asked Peter, James and John (Mark 14 v 37). And then, on top of it all, there was betrayal by a man who had broken bread with him a matter of hours before—then an illegal trial, false witnesses, a judge with no moral fibre, a wrongful conviction. And then the spitting, the abuse, the humiliation, and the shame and agony of the cross. If you want to know what patience is, what longsuffering looks like, all you need to do is to read through one of the Gospels. Yes, “love is patient”. Jesus was patient. 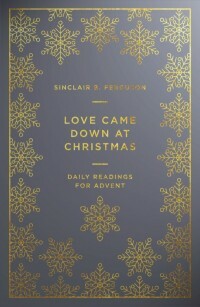 Love Came Down at Christmas by Sinclair B Ferguson: Love is at the heart of Christmas—it's the reason behind all our gathering and gift-giving at this time of year. In this Advent devotional, Dr Sinclair B Ferguson refreshes our hearts as we reflect on the source of it all—love incarnate, Jesus Christ. Over the course of December, this devotional walks through 1 Corinthians 13 phrase-by-phrase, showing us that "love is" the Lord Jesus himself. Sinclair Ferguson brings the rich theology of the incarnation to life with his trademark warmth and clarity. Drawing on stories from the Gospels, we'll see what "love" looked like in the life of Christ, and be challenged us to love like him. Each day's reading finishes with a question for reflection and a prayer.